It is specially designed to take care of two critical factors which directly affect the quality of the Liquids. It also provides the benefits of the effective manpower utilization. d re-start from the point, when cover is pushed down. 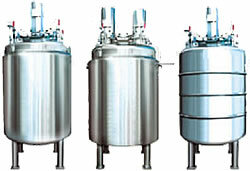 Liquid Manufacturing Plant consist the following equipments and accessories. The Sugar Syrup Vessel is supplied with high speed stirrer & electrical heating (In small model ) / steam heating facility (In bigger size model ). The product during emulsion formation is re-circulated through In-Line Homogenizer or Liquid Transfer Pump.